Updated April 5, 2019 By // by Kris. This post contains affiliate links. This means we may make a small commission, at no extra cost to you. We accidentally stumbled across paradise in Amed Bali. And now we never want to leave! On our family gap year with 4 young kids, we had a couple of Airbnb fails in a row. 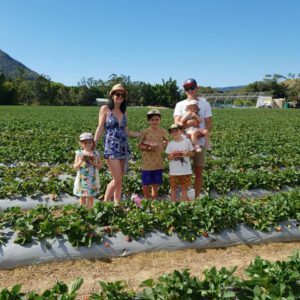 We had booked our entire month’s worth of villas through our favourite website for finding family accommodation, and detailed this in this article. 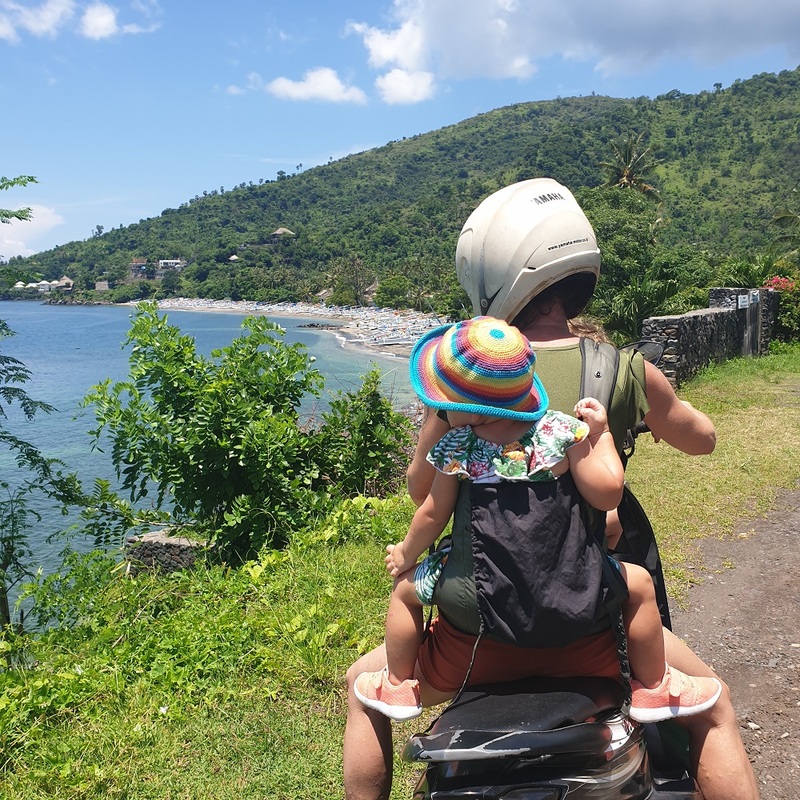 As a family with some slightly queasy kids on our hands, I didn’t really want to venture too far afield, but I knew that the overbuilt and full-on hassle of Sanur was really not our style, so we decided to brave the 3-hour drive north and see where the wind blew us. An incredible and kind of weird lunchtime stop saw us sitting in a massive aeroplane with views over Keramas surf break, (world famous, if you are into that sort of thing). Of course Brian then had to have a surf while we watched over the pitch black sand from the safety of our infinity pool. You seem to do a lot of this in Bali! As we pressed north the city began to open up and soon we found ourselves winding through the brightest green rice fields, banana plantations and other fluoro green crops we couldn’t identify but that looked delicious! The road wound up and over mountains reminiscent of Hawaii with that incredibly fertile soil giving birth to so much green jungle. The kids remained nauseous, and finally went to sleep, luckily. As we finally arrived into Amed itself it was into the heaviest sort of south east Asian downpour you can get. It was raining absolute sheets and we were reconsidering our decision to throw caution to the wind and NOT BOOK ANYTHING THIS TIME! 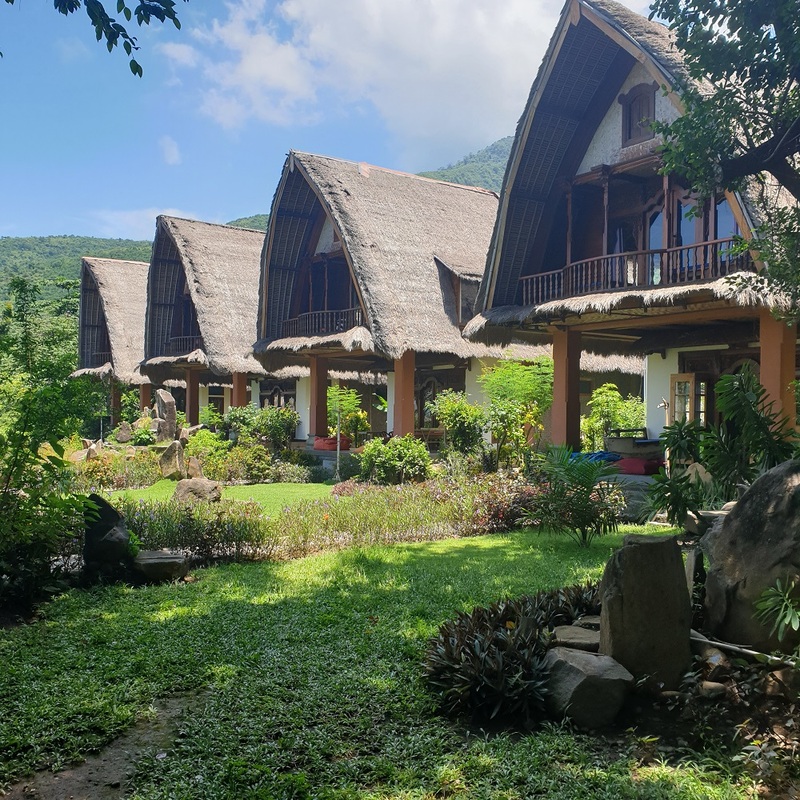 Brian took it in his stride and went into a few bungalows before finding our new home – a beachfront bungalow for only $35 a night, including breakfast. A 3 hour drive from Sanur up the north east coast of the island bought us to Amed. It wasn’t until the morning after we arrived that we discovered where we actually were. As the sun rose, the distant volcanic peaks of Lombok were visible but just to the north the majestic and enormous perfect volcano Mount Agung sat like a sentinel guarding this beautiful place – Amed, Bali. Mount Agung is a symbol of power and beauty. It has a perfectly shaped cone with constant plumes of smoke wafting from its 3000m peak. It dwarfs anything around it, on its descent to sea level, which is where we sit. Amed is a series of bays, linked by a narrow, winding and sometimes bumpy road over 14km or so. The next bay to the south is the famous Jemeluk Bay, and from here it takes another 10 minutes by scooter past Lipah Bay to reach the Japanese Shipwreck Bay. 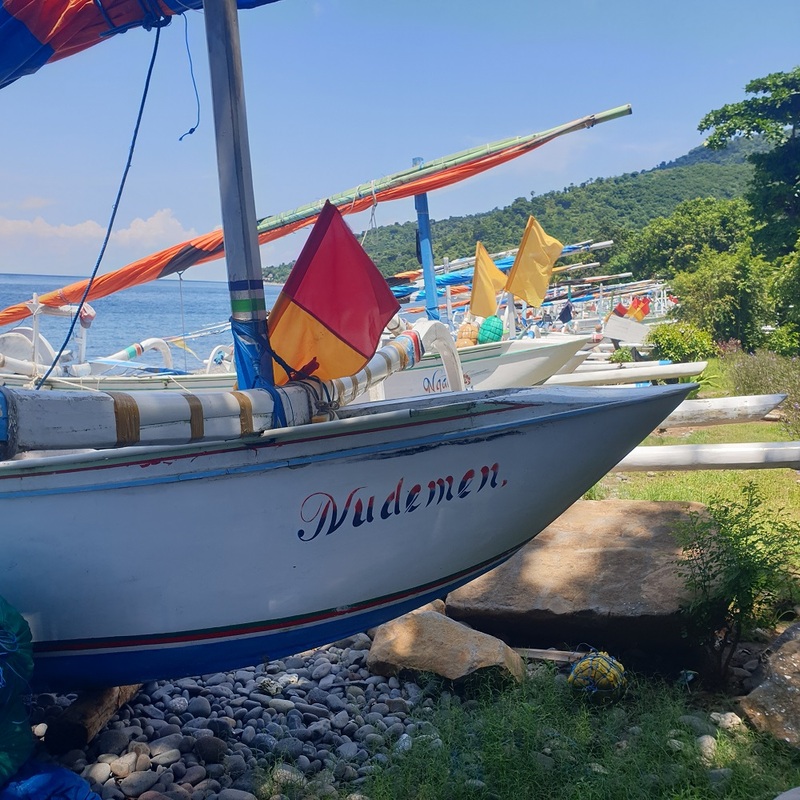 As we cruised up and down these hills, bright green vegetation to the west and the azure blue rock lined bays to the east, we were reminded of a somehow Mediterranean feel, but blended with Southeast Asia. Our bungalow is in the first and busiest part of Amed Bali, with a black stony shore, with restaurants and dive shops, laundry and ATMs. When I say busy, it’s not really busy at all, and you can walk down the middle of the road if you really want. The accommodation options in this area are many, and we arrived in low season in late March. Having a scooter is by far the best way to travel over these nice quiet roads. We paid 70,000IDR per day for scooter hire, and 50,000IDR per day for a snorkel set. These prices are sure to vary, depending on who you rent from. We saw scooters advertised down the road for 45,000IDR. There are private taxis everywhere too, they will take you locally and further afield. Our trip from Sanur cost 800,000IDR. Our next taxi to Sideman is costing 300,000IDR. Again, prices can vary and don’t just settle on the first price. Boats will take you on seafaring adventures for snorkelling and diving. We got told 400,000IDR for a 3-hour snorkelling trip, for the whole boat. You can also catch a fast boat to Gili Islands from Amed, for around 600,000IDR per adult return. Staying in Amed, you have many options. As you first enter town, this is called Amed Beach. We stayed at 3 Brothers Guesthouse about 1km after this. After the first bay, you reach Jemeluk Bay, this area is renowned for snorkelling in the crystal clear and sheltered waters of the bay. There are so many fish and starfish here! Further on there is Lipah Bay which would also be a nice place to stay with a few low key guest houses and a narrow strip of white sand. Then there are some quieter villages and green hills, as you follow the road around before you come to the Japanese Wreck and find another collection of hotels here. It is always hard when you arrive in the pouring rain, having no idea where you are and hoping you have come to the right place. 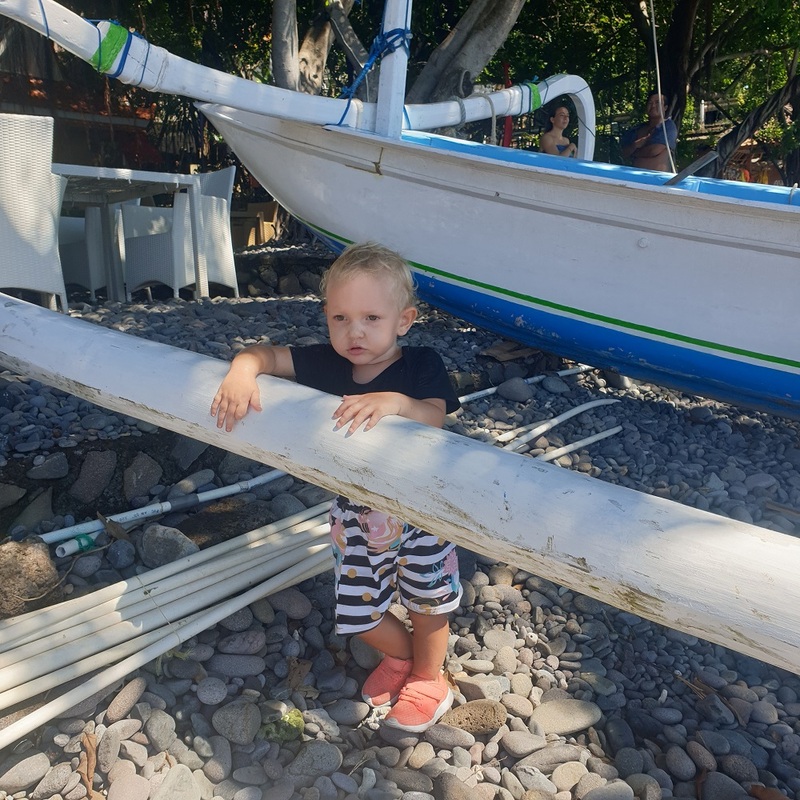 We were super happy with our location, as it was so quiet compared to the streets of Canggu and Sanur, but there was enough going on to keep us entertained as well. I just love that we can snorkel right off the beach at the front for amazing fish life! There are a smattering of bars, restaurants and small shops around too. We are on the beach side of the road, and you can get a room on the other side from as little as 250,000IDR. Airbnb has some incredible and well-priced villas in Amed and surrounds for bigger groups. Check out this gorgeous Villa Disana. At only $150 a night for 4 bedrooms and a beachfront infinity pool, um, I think we will stay here next time! 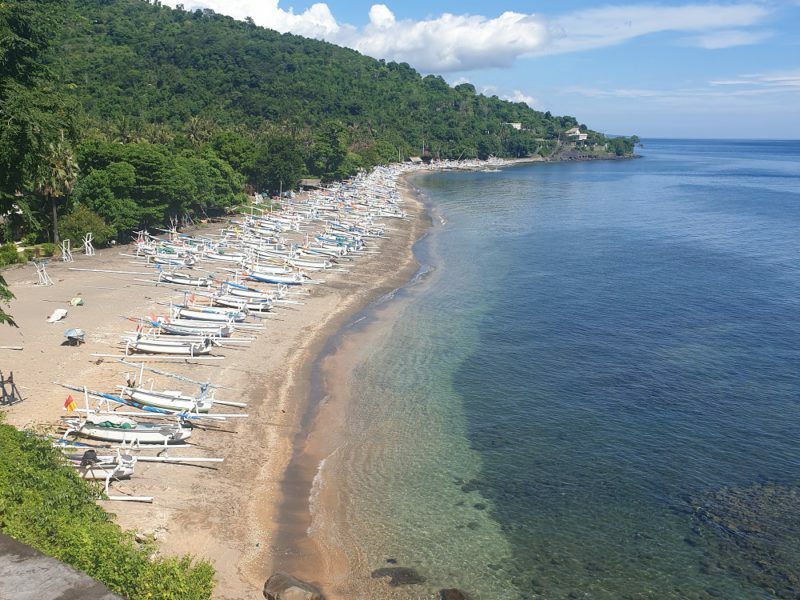 Bali Amed Bluestar Seafront Bungalow is an awesome beachfront position and is sublimely located for the great snorkelling in the bay. At Lipah Bay stay at Blue Moon Villas or Villa Bukit Segara. The latter has a restaurant with the best views, and a sailing school attached. Palm Garden Amed has a flash pool, an amazing restaurant and is on its own private white sandy beach. 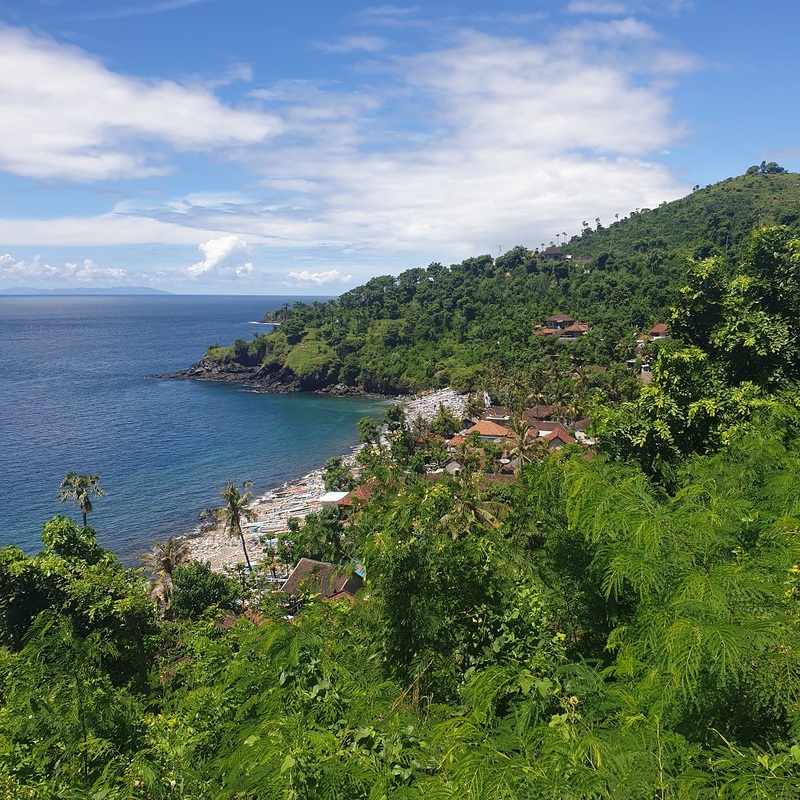 BaliKu Dive Resort is a gorgeous place to stay up on the hill overlooking the Japanese wreck site. The rooms offer commanding views over the stunning bays to the south, and there is a dive school on site. Kawi Karma cottages look so cute, and a virtually steps away from snorkelling the famous site. Stairway to Heaven is also another great option, beachfront. 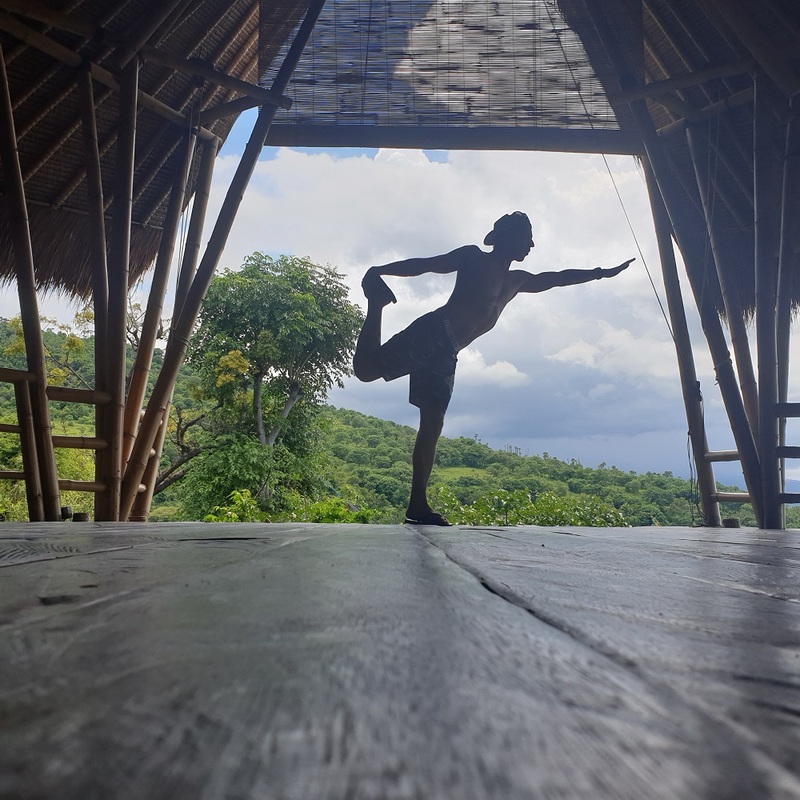 A little bit further south of this, Meditasi Bungalows is a stunning budget spot offering accommodation and yoga. We were planning to stay here, but it is right at the other end of the coast from Amed town. The best sunset spot ever! 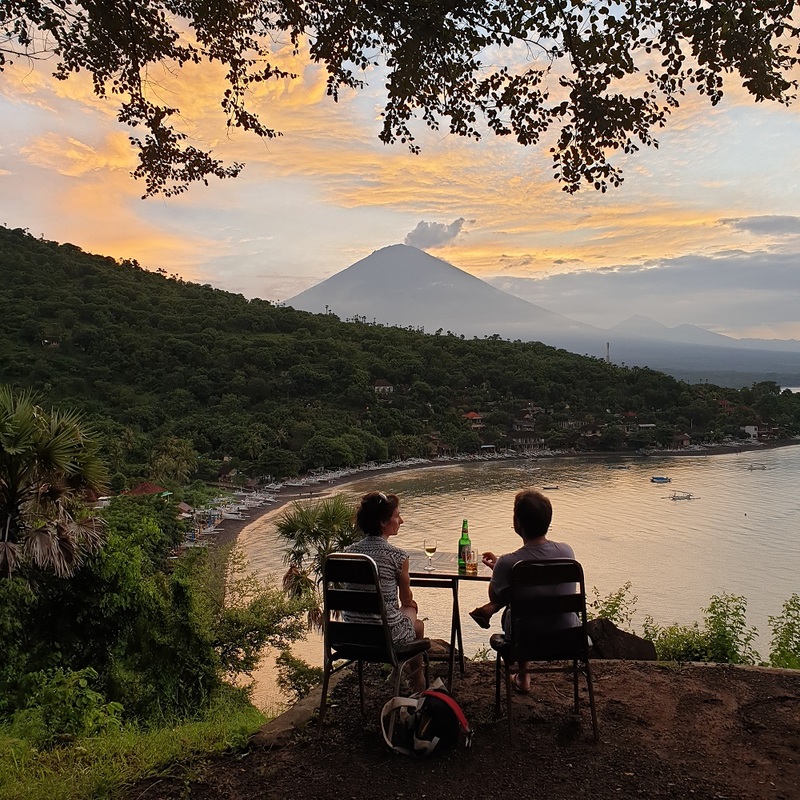 Warung Sunset Point is THE best spot to see the sunset over Mount Agung. It is like nothing else I have ever been lucky enough to see! Such a special spot and a very breathtaking experience. Unfortunately it rained most afternoons in March so we only got to see it once! 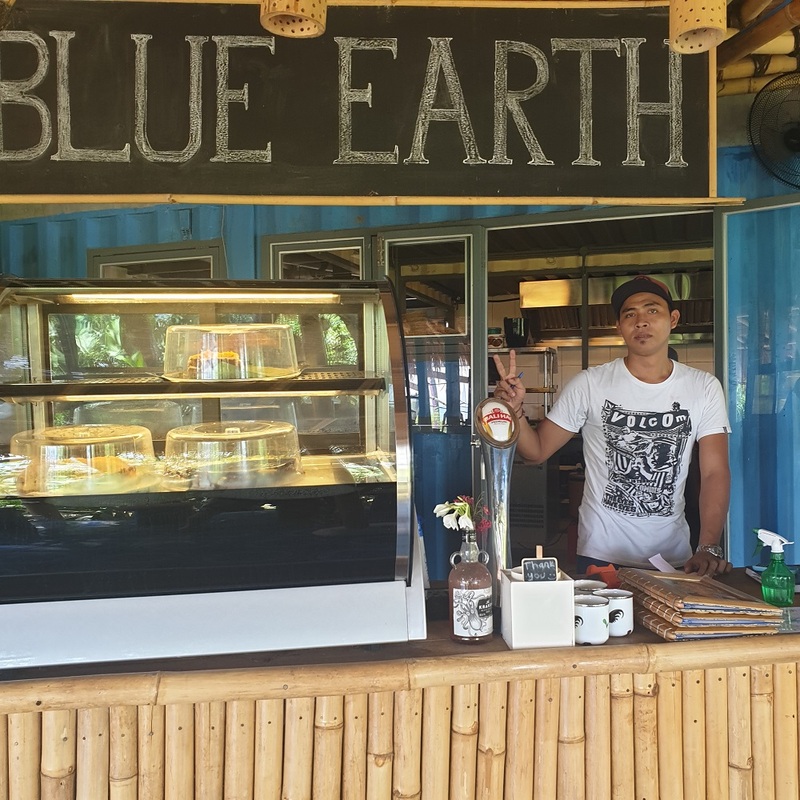 Try Blue Earth Village just across the road from this for stunning views in an eclectic atmosphere of bamboo and shipping container structures. Try the pork in lemongrass! They even have a great kids menu, and a corner with fun toys and games. Every parent’s dream come true! There are daily yoga classes here too, just check on their Facebook page for the latest timetables. Their coffee is fantastic, and it is the only place we found for decent espresso in town. Most hotels and villas have their own beach front or ocean view restaurant attached, and many have decent seafood options. 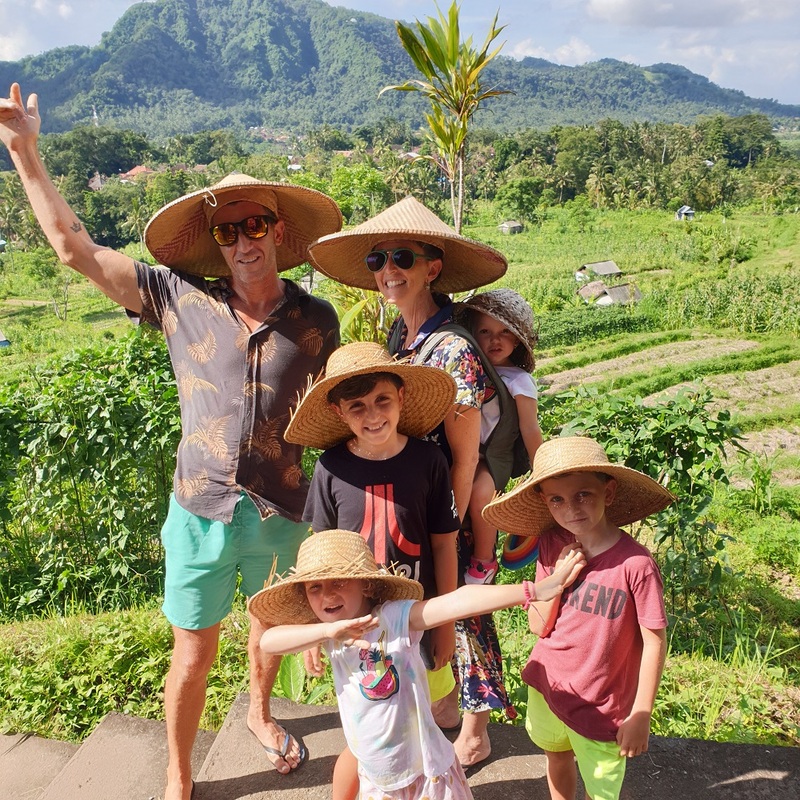 The menus seem to be a variation of Indo/Western with pizzas, pasta, chips and pancakes featuring heavily (this pleases the kids) alongside Balinese favourites such as Nasi Goreng and Cap Cay. The fried seafood spring rolls (Lumpia) here are the best we have had anywhere in Bali! Our favourite place to eat was the local Warung across the street from our bungalows. The Cap Cay was so delicious and they made a killer spaghetti bolognese great for fussy kids. Their pancakes and jaffles also kept my little ones happy. You can hire snorkelling gear everywhere around town, and on the beaches in front of the best snorkelling spots. Prices start at 35,000IDR per day for mask, snorkel and fins of varying quality. 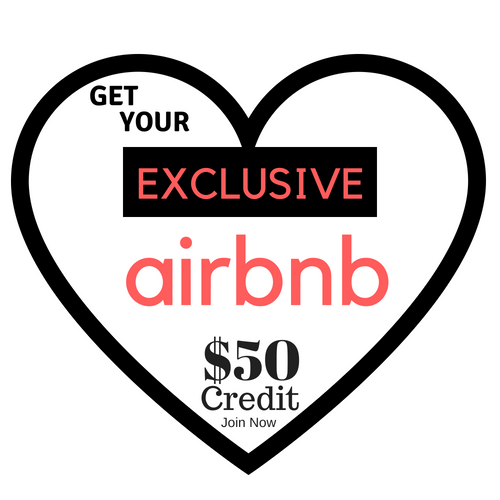 Don’t pay more than 50,000IDR. For us, the ability to swim straight off your front beach and find an incredible array of fish life is really stunning. The hard type coral is abundant, but there is some plastic rubbish around the place. The fish life is simply astounding! We saw hundreds of varieties of brightly coloured reef fish, sea snakes, eels, stingrays, starfish and jelly fish. It is better snorkelling at high tide and watch out for strong currents and rubbish at the turn of tides. You can get a fishing boat to take you up and down the coast visiting all of the snorkelling spots, but for a price of 400,000IDR, we opted to do the same spots via scooter instead. Jemeluk Bay is a sheltered north facing bay with gorgeous clear protected waters and decent hard coral. There are so many fish it’s not funny! I loved watching the faces of the kids as they discovered a brand new kind of fish! There are supposed to be large numbers of elusive octopus hiding in the reef here, I really hope to see one of these. Park at the first carpark and then walk along the shore to the south to find a collection of warungs with daybeds which are free as long as you buy a drink or some food there. Out in the bay, under a white buoy there is a temple that has been sunk to make another artifical reef! It was so cool to see the fish around this temple. Ask the people on the beach to point you in the right direction. 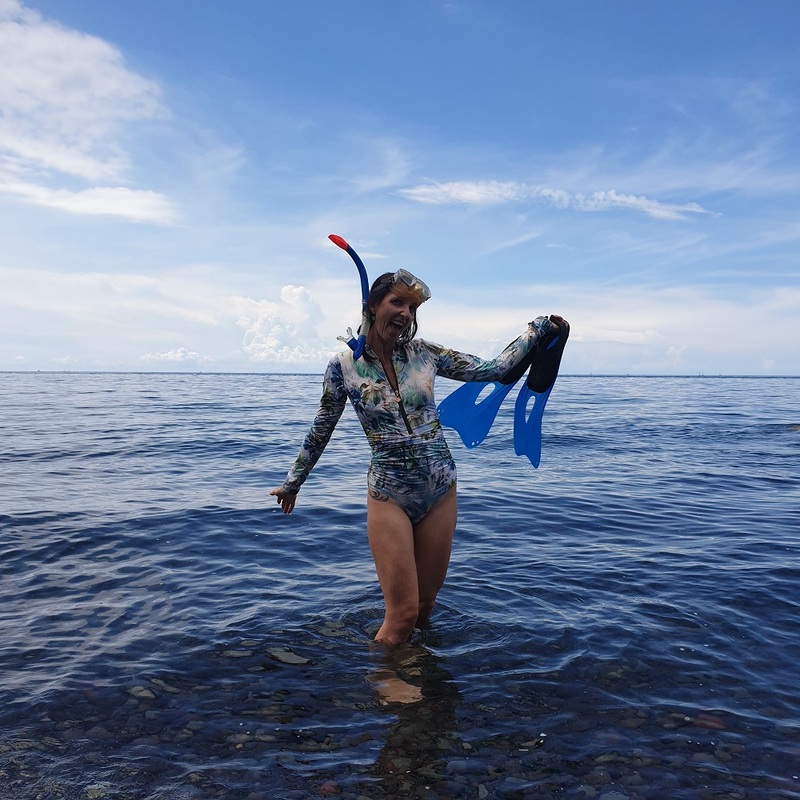 The water here was clear when we started snorkelling, but when the tide turned it carried in a big pile of plastic rubbish floating on the surface. While the beach here is relatively clear, it seems you just can’t escape the plastic scourge in SE Asia. I had to sit on the beach and wait half an hour for it to pass by before I could go swimming again. Snorkelling over the Japanese Wreck was like a dream come true. I absolutely love seeing shipwrecks, and without a dive ticket, this is one of those wonderful opportunities presenting a great example only 30 metres offshore. It is just a shell of a ship. And from what I can find out, there is no amazing story to it, and nobody really even knows where it came from. But they did find an Asian style toilet on it at one time, so it was designated as Japanese. Makes perfect sense. ‘Japanese Shipwreck’ does elicit a sort of war time epic imaginative tale though, so let’s just leave it at that. There are PADI schools here in abundance. I am not a diver, but you can do your course here for around $450USD. The slickest operation I can see here in central Amed appears to be Adventure Divers Bali. They are constantly ferrying divers to and fro in minivans, and have professional looking instructors and equipment. There is accommodation and food available too. At BaliKu Dive Resort you can stay and dive. They have Australian trained dive instructors and are located right at the Japenese Shipwreck. There is another famous shipwreck here called the USS Liberty. It is one of the top wreck dives in all of Asia. It is also close to the shore, but a little deeper. For more info check out DiveZone. You can even trek to the summit of the volcano! There are scooters, SUPs, kayaks, boats, snorkelling gear and motorbikes for rent. If that is not enough, a fast boat across to Gili takes about one hour. 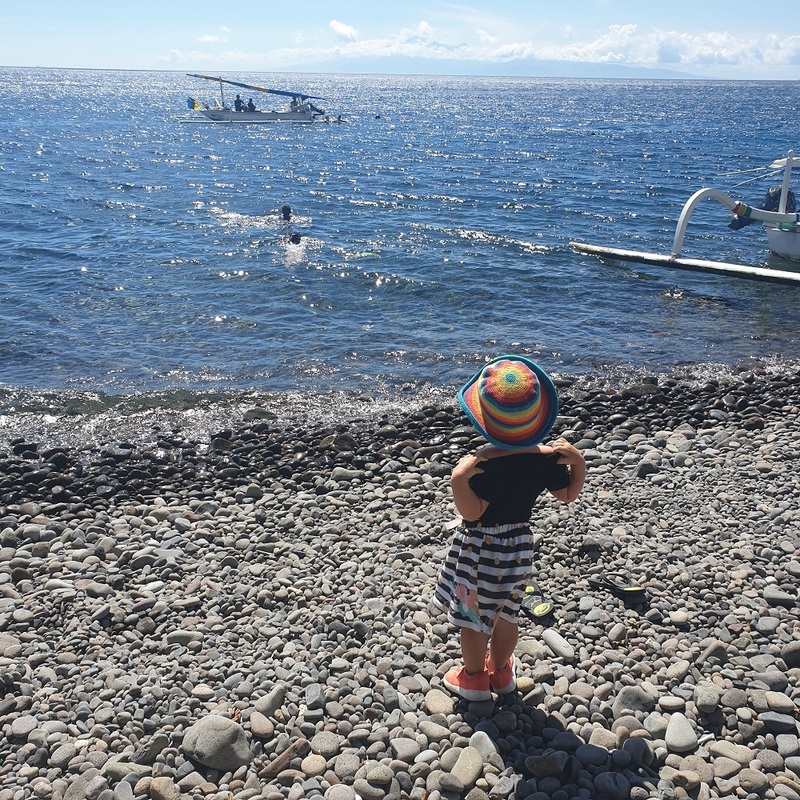 And if you drive south to Candidasa, you can catch the ferry to Lombok. There is a tattoo parlor, yoga, a barber and live music in high season. And you can arrange trekking here which takes you to the summit of Mount Agung! All of this only 3 hours out of Denpasar! We absolutely love this place. 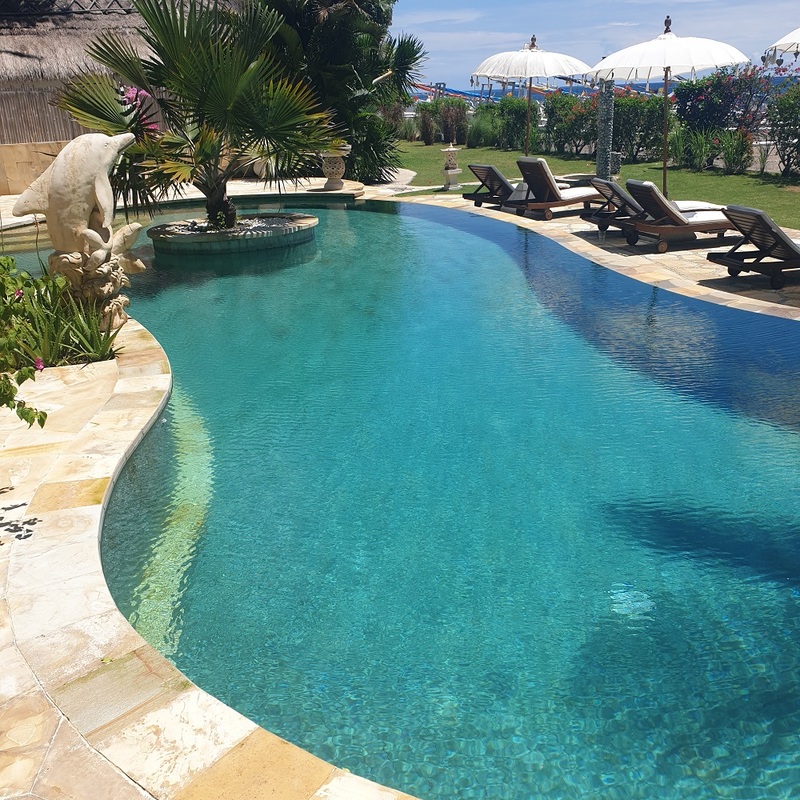 It is as if we have discovered a whole new part of Bali that we didn’t even know existed! Now we have been schooled by Amed Bali. We definitely give this place a big thumbs up. 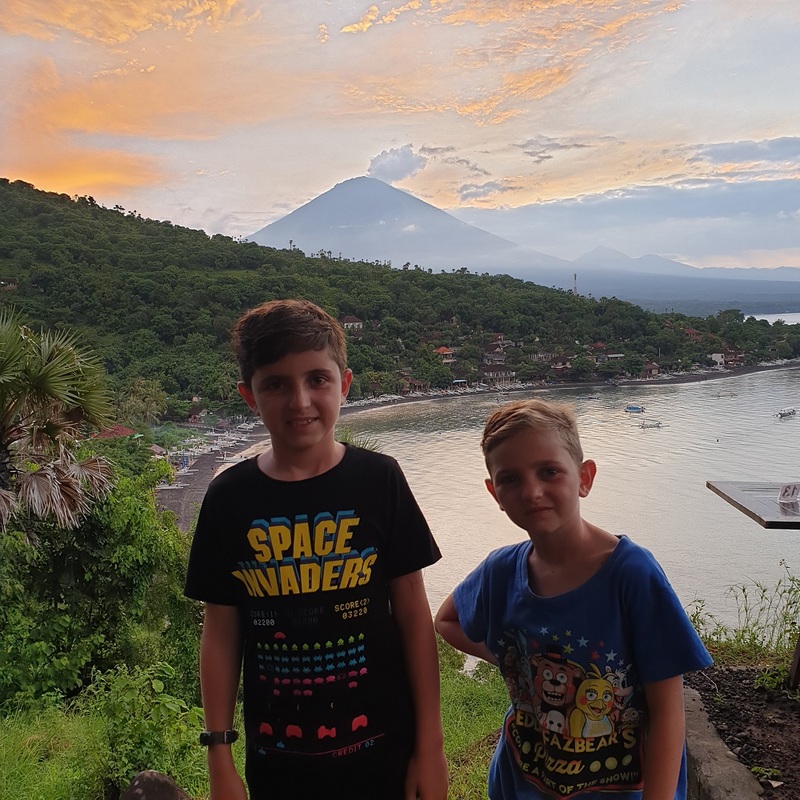 Only a 3 hour drive from the touristy areas of southern Bali, I recommend you to come and check it out for a few days on your next Bali holiday. This is the real Bali. Such a beautiful, peaceful and friendly place away from the hustle and bustle of the super touristy places down south. I can’t wait to explore more of this northern part of the island when we come back to Bali next time. Anytime! If you get the chance head on over to Amed for at least a week you will not be disappointed. Thanks, Tracy, I try my best! Amed is really a must see place when you visit Bali. Add it into your itinerary next time you visit, you will not be disappointed. Thanks! 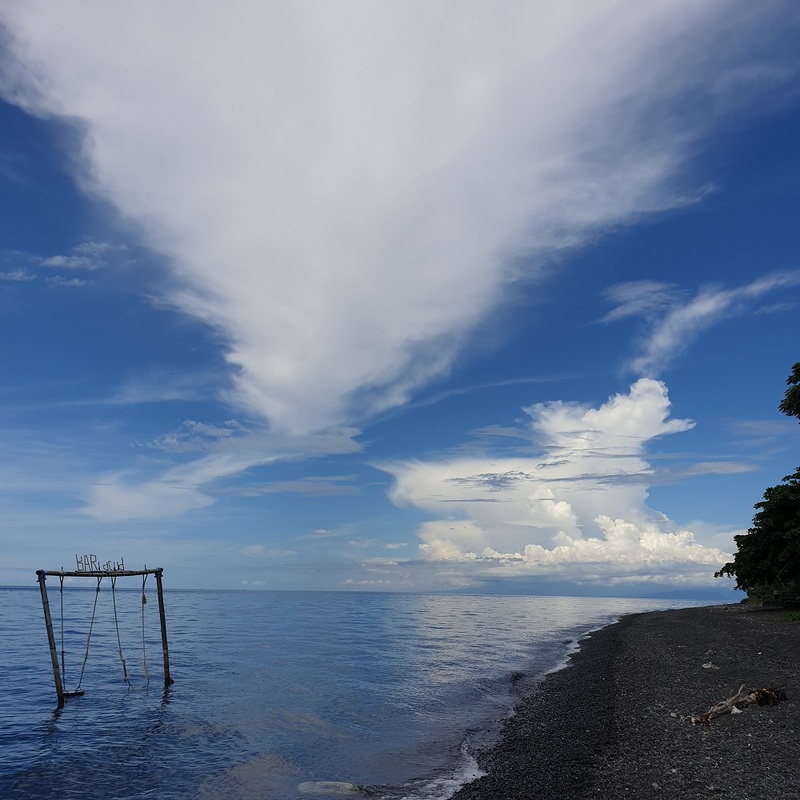 Amed is a magic secret spot in Bali where not many people have visited. We only accidentally visited and found it to be one of the best spots in Bali! 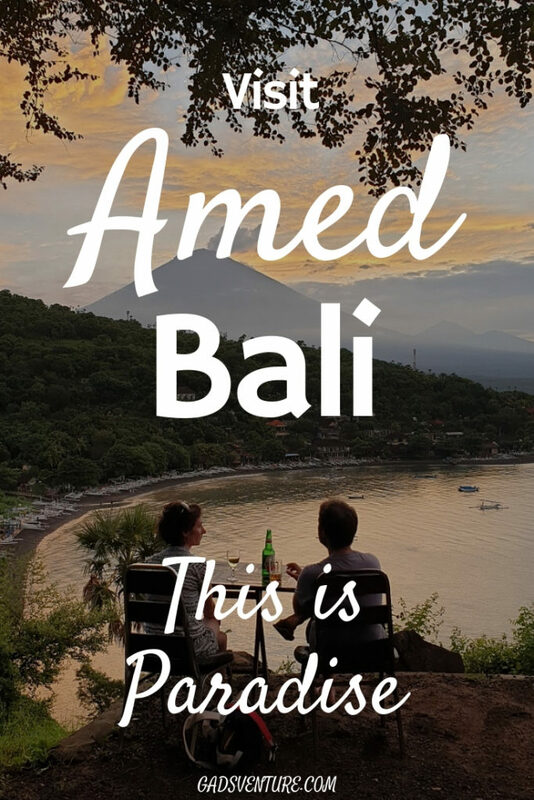 This is a part of Bali that I had not heard of, nor considered visiting, but you really described it well, and now I am ready to head that way myself. The pictures are beautiful and I am like you, I do not need the hustle and bustle of a city full of tourists looking to get drunk or worse. 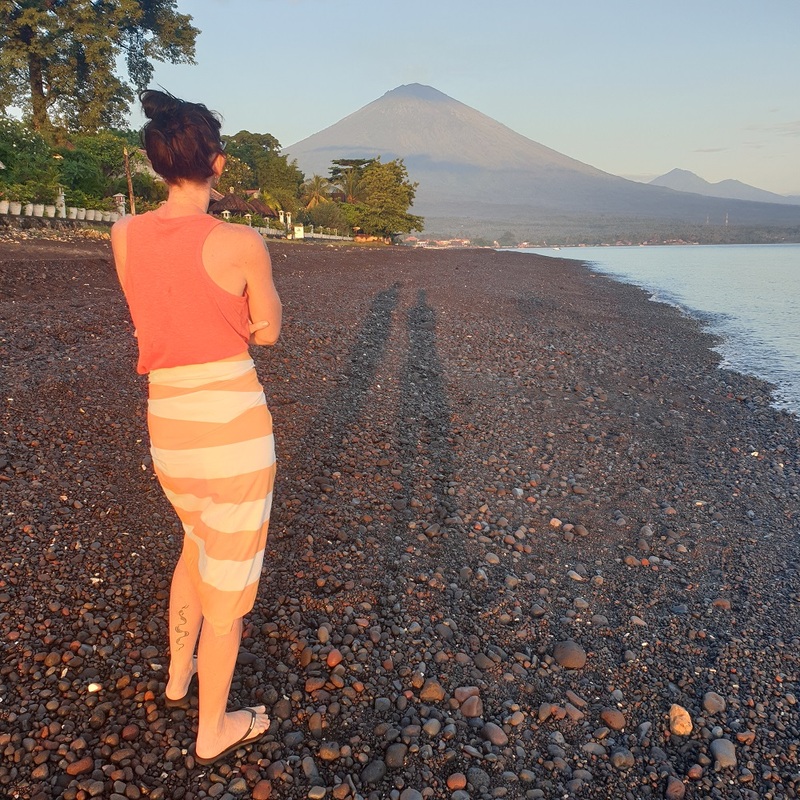 I know that you had not planned on Amed, Bali, but you sure did luck out! The accommodation price is super reasonable, and who doesn’t love scooting around on a scooter in paradise! The bays are wonderful, and I am pretty sure I could spend a couple of weeks there and never be bored. The restaurants and the activities are enough too to keep you busy and perhaps more important, the kids too. I remember very well what it was like traveling with a young family – never a dull moment is what I used to say! It seems that you al handled this trip well! You need to plan more of these non-booked vacations so you can share the adventures with us all! 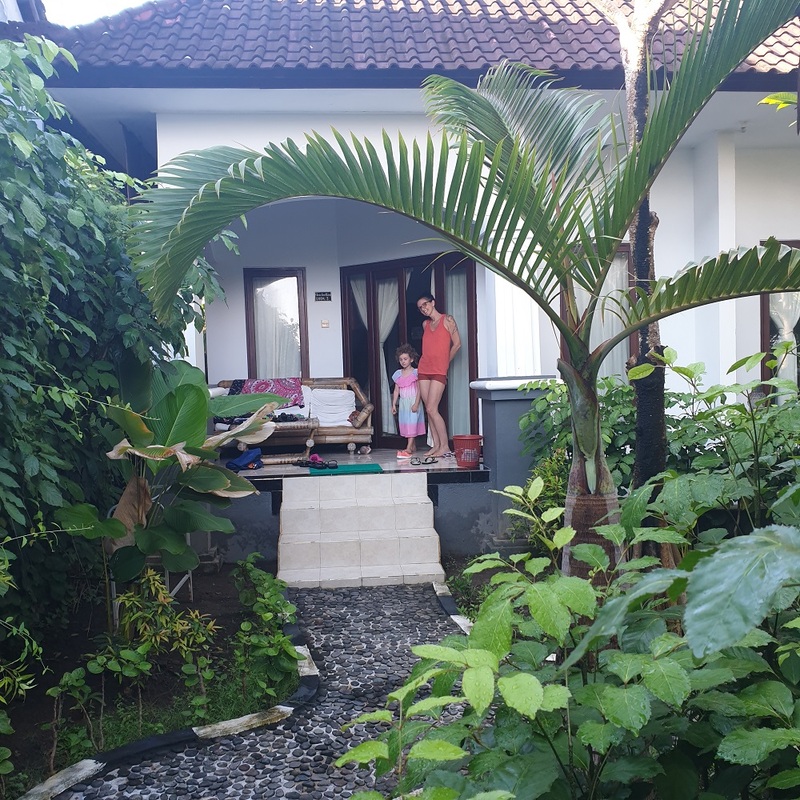 I really thank you for sharing your Amed, Bali trip and it is so wonderful to hear that it all turned out well for you. The food, the scenery, the savings, and everything else really came together for you and your family! Thanks Dave!! It often happens when a bad thing happens something better can come along and blow your mind! Amed is a special place for only special travellers who enjoy culture and beauty! You do have to visit this place you will be blown away!